The Greek government is ready to accept economic reforms it rejected just a week ago in a desperate bid to agree a new bailout and keep hold of the euro. European leaders gave Greek Prime Minister Alexis Tsipras an ultimatum earlier this week: Convince us by Sunday that you're serious about putting Greek finances in order and reforming the economy, or you're out of the euro. Greece sent EU officials late Thursday a plan to cut spending, raise taxes, and phase out tax discounts on some tourist islands. According to a copy of the document seen by CNN, Greece is also proposing changes to public pensions, such as raising the retirement age, and steps to improve tax collection. The package is very similar to one that was rejected by Tsipras just 10 days ago and by the Greek people in a referendum on Sunday. Greece also wants creditors to help to ease its enormous debt burden. 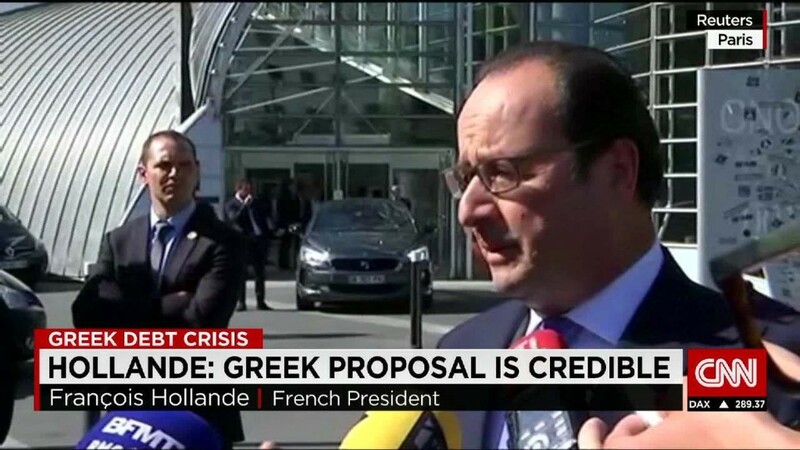 French President Francois Hollande said on Twitter that Greece's proposals were "serious, credible and show a determination to stay inside the eurozone." But he said that it's not a done deal yet. While committing Greece to austerity it had previously rebuffed, even these concessions may not go far enough given the rapid deterioration in Greek finances in the last two weeks. They will also generate fierce political debate. While the prime minister can count on the support of pro-European opposition parties when the proposals go before parliament on Friday, many Greeks will be furious at the U-turn. Assuming they pass, they will then be submitted to eurozone finance ministers on Saturday, and to an emergency summit of European Union leaders on Sunday if necessary. Without a deal by Sunday to start formal negotiations on a third Greek bailout since 2010, the country will be bankrupt. The European Central Bank would be forced to cut off funds that are keeping Greek banks on life support, and the Greek government would have to start issuing IOUs to pay pensions and wages. In those circumstances, Greece would have little choice but to start printing its own money -- and become the first euro member to drop out of the 16-year old currency union. 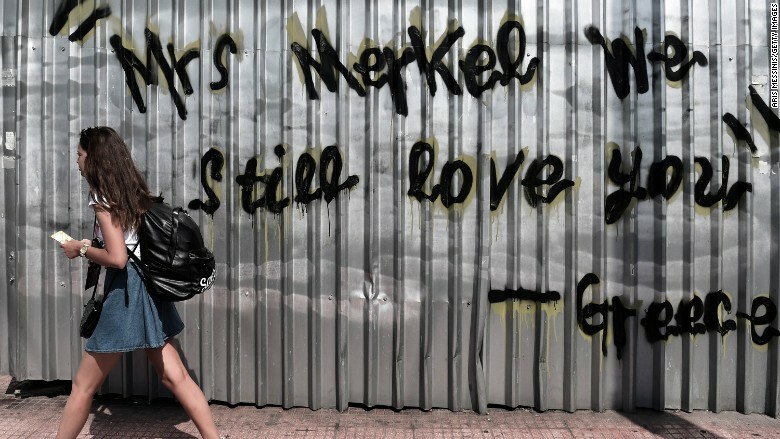 The Greek government is trying to persuade leaders like Germany's Angela Merkel to hand over more cash. Greece wrote to Europe's bailout fund Wednesday, formally requesting a new three-year loan. It didn't say how much it needs, but it will be at least 50 billion euros -- according to the International Monetary Fund -- and probably much more. IMF Chief Economist Olivier Blanchard told CNN any deal needed to contain reforms, and debt relief, "otherwise the plan makes no sense." Other eurozone countries are deeply skeptical about Greece's commitment to reform, given years of foot dragging and the country's rejection of the most recent offer of help. And analysts say it's still going to be tough to get agreement, even if the odds of a "Grexit" have fallen slightly. Creditors may insist on even harsher terms than those Greece has proposed, largely because the black hole in its finances grows with each passing day without a deal. The country's banks are shut, cash withdrawals are capped and economic activity is slowly grinding to a halt. On the other hand, EU leaders are desperate to keep the euro together. It's the most visible symbol of 60 years of economic and political integration. They worry about the fate of Greece if it collapses -- the humanitarian and geopolitical cost. But they also worry about long term damage to the credibility of the euro. Unlike the U.S. dollar, the euro is not backed up by a single country or government with authority to move money around in times of crisis. Instead, it depends on all 19 countries that use the euro playing by the rules on borrowing, and bailouts. Allowing one member to break the rules year after year could be fatal. Other countries using the euro have poured billions into Greece, and resist fiercely any suggestion that some of that debt should be written off. Then there's the precedent that would set: Portugal and Ireland, for example, met the terms of their bailouts but still owe billions in emergency loans. They could argue for the same treatment. Germany's economy minister, Sigmar Gabriel, spelled out the danger of giving special treatment to Greece. "That would be the end of the euro," he told reporters on Monday. -- Clare Sebastian, and Zahra Ullah in Athens contributed to this article.